While the Panoz Q9 nearly became the first hybrid to run at Le Mans back in pre-qualifying in 1998, it appears the history books will finally be re-written this weekend when Hope Racing’s Oreca Swiss HyTech Hybrid takes to the track for Saturday’s 24 Hours of Le Mans. Thirteen years after the revolutionary, but overweight “Sparky” failed to qualify for the French classic, the Swiss-based team, led by co-owners Benoit Morand and Jean-Marie Brulhart, have ticked all of the necessary boxes required to make the history-making debut, although it all came down to the wire, quite literally. With the car having been withdrawn from the second Intercontinental Le Mans Cup round at Spa due to a vibration that affected its Flybrid-built hybrid, Hope was given until May 20 to get its car certified by the ACO, otherwise face expulsion from the the race. 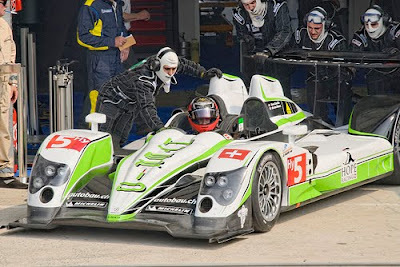 In order to be certified, the Oreca 01, powered by a 2.0-liter Lehmann four-cylinder turbo, needed to complete the entire length of the Le Mans pit lane (400 meters) entirely on KERS. Sure enough, the test was scheduled for May 20, the final day in the ACO’s deadline, at the Lurcy-Levis circuit in France. “It was almost something from the movies, the way it happened,” technical director Andrew Sayer said. “The ACO arrived at about 4 p.m. in bright sunshine, as it was for the two days. Michelin left, taking all the wet tires with them, but then a couple of dark clouds started appearing. As we’re discussing with the ACO and showing them around the system, big spots of rain started to come down. “Obviously I was panicking. [Team co-owner Benoit Morand] runs in and says, ‘Can we go now?’ There was a motorbike track day going on at the same time, so they stopped half an hour early for us. We pushed the car out to the straight line and marked out [the distance points] with the ACO. We then did our engine charge... Steve [Zacchia] then pulled away and stalled it, the first time he did that in the last six days of testing! “He pulled up to 60 kph, cut the engine before the first cone, ended up driving 463 meters on the KERS. Steve then started the engine back up, turned around and came back to us. We put the umbrella over him to keep him cool. By the time we connected the computer to download the data, it was raining so hard that we had to take the umbrella off Steve and push back to the garage immediately! While it was no doubt a close call to making it into Le Mans, Sayer says the original problem, the natural vibration of the internal combustion powerplant that caused a resonance issue with the hybrid, has been alleviated by going with a different sized flywheel and modifying the engine insulation. And with two further days of testing in the books at Magny-Cours, where all three of its drivers, Steve Zacchia, Casper Elgaard and Le Mans veteran Jan Lammers, who will be making his 22nd start at Le Mans, racked up a total of 750 kilometers, the team is hopeful of making a solid debut run.